Walking the Hollywood Walk of Fame, Disney style! 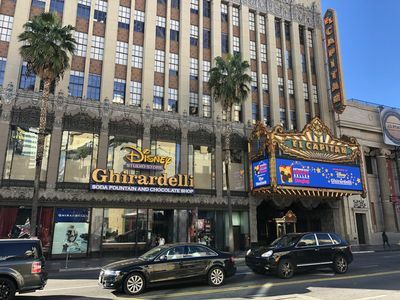 If you are making Hollywood part of your Disneyland Resort vacation plans, here is a complete tour of hitting the 18 Disney stars on Hollywood Boulevard. This is the third of a series about Disney outside of the Disneyland Resort. If you are members of D23 and careful planners, you may be able to book a tour of The Walt Disney Studios (to read that article just click here.) 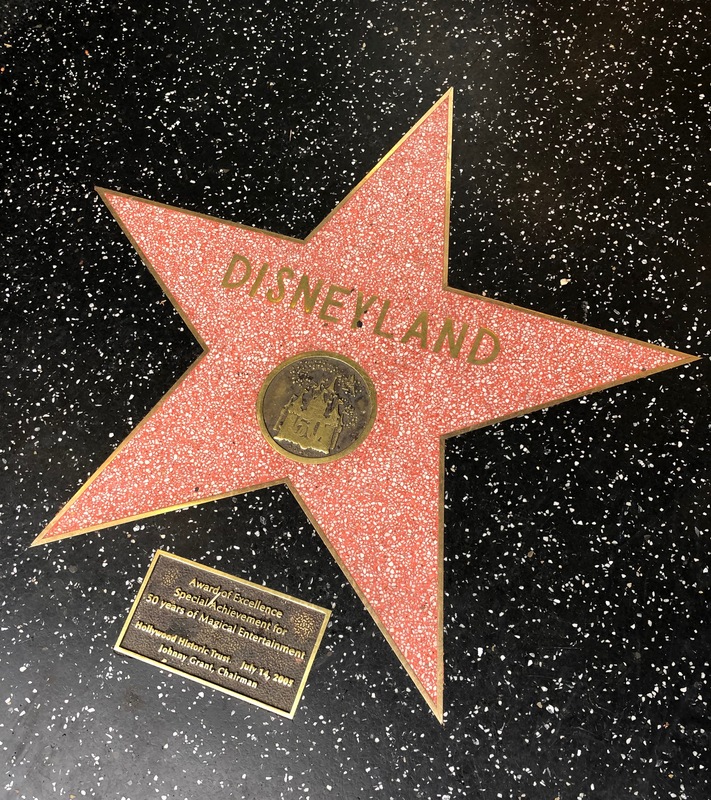 If getting your picture in front of The Hollywood Walk of Fame Disney Stars is your cup of tea, this is a carefully planned tour to hit all of the highlights. 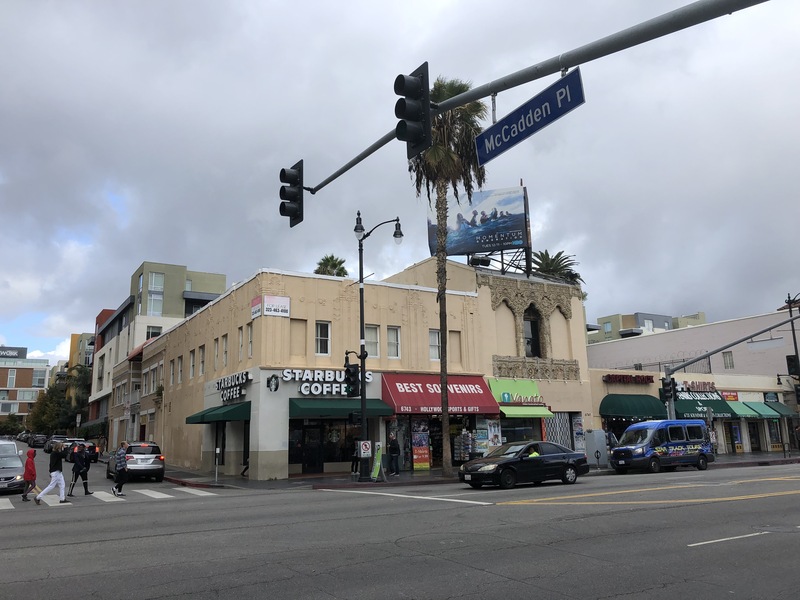 Begin your walking tour at the corner of Sycamore Avenue and Hollywood Boulevard. Photo by Todd Pickering. 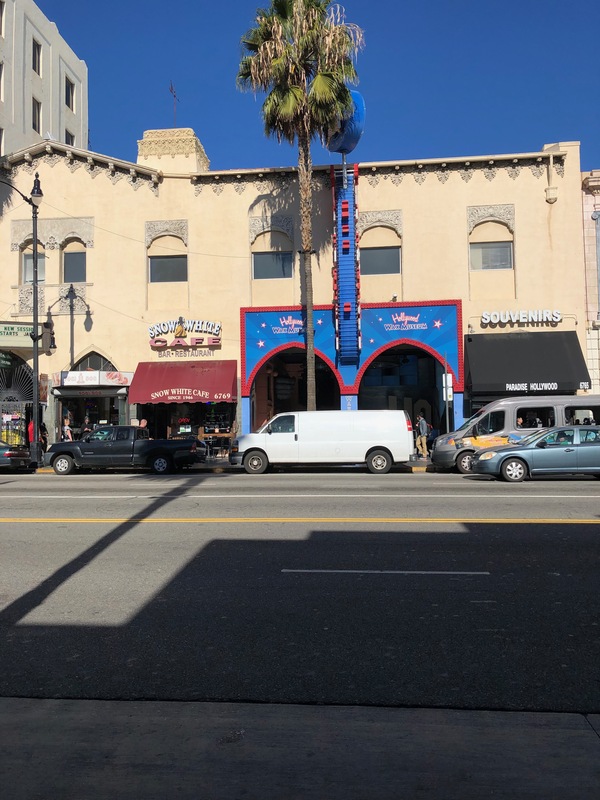 Begin your tour on the northeast side of Hollywood Boulevard and Sycamore Avenue. One block west of Sycamore is La Brea Avenue, which is the western end of the Walk of Fame. There are a lot of music stars and famous stars on the south side of the block, including Stan Lee for all of you Marvel fans. 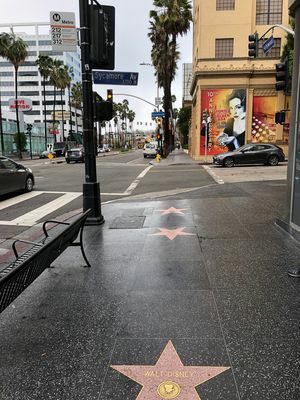 In a small plaza that runs along La Brea are statues of four women of the Silver Screen surrounded by some very famous stars. 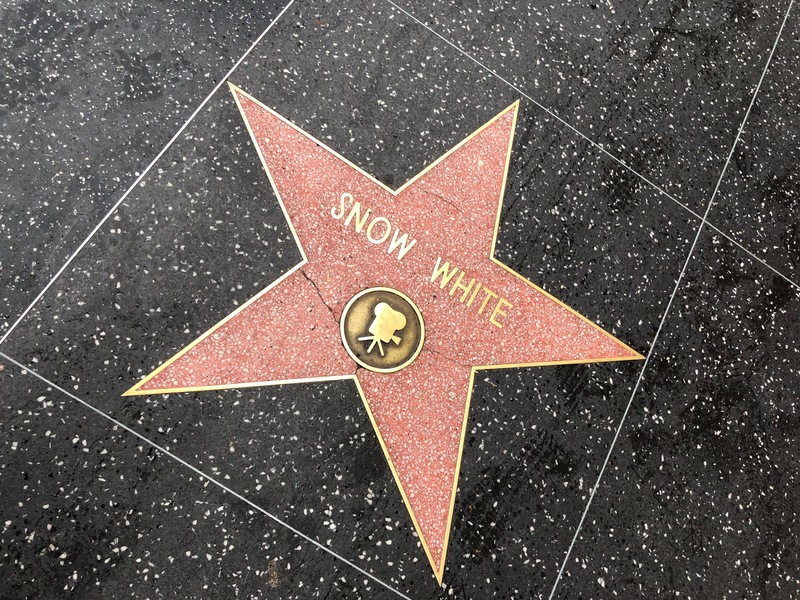 You may want to check out that block before embarking on your Disney portion of The Hollywood Walk of Fame. 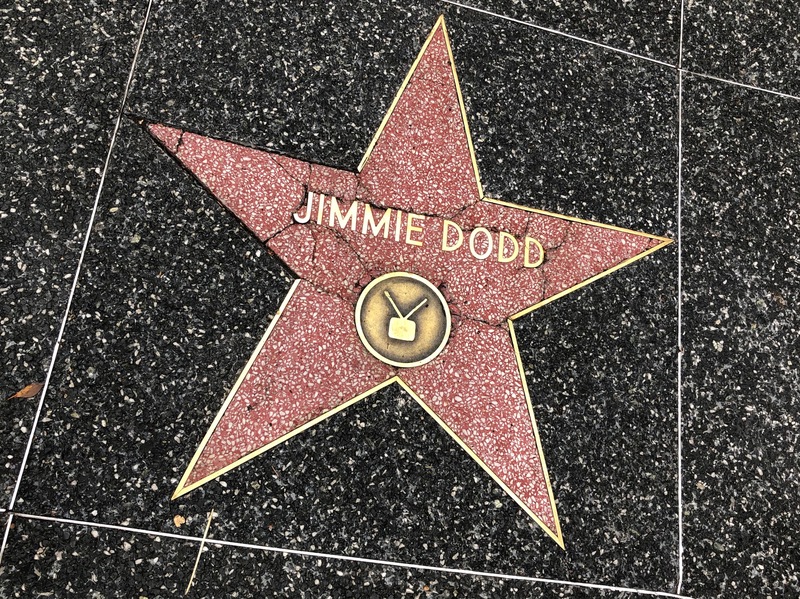 Jimmie Dodd, the leader of the original Mouseketeers, is your first stop. Photo by Todd Pickering. Jimmie Dodd may be lost on the younger crowd, but he was the original leader of the Mouseketeers on The Mickey Mouse Club, and wrote a lot of the songs for the show. The Mouseketeers have all talked very fondly of him, and his leadership of the group was much appreciated. You only need to head two stars to the east to find your next Disney stop. Just two stars away from Jimmie Dodd is Walt Disney's film star. Photo by Todd Pickering. Walt Disney's first star is to honor his achievement in film. 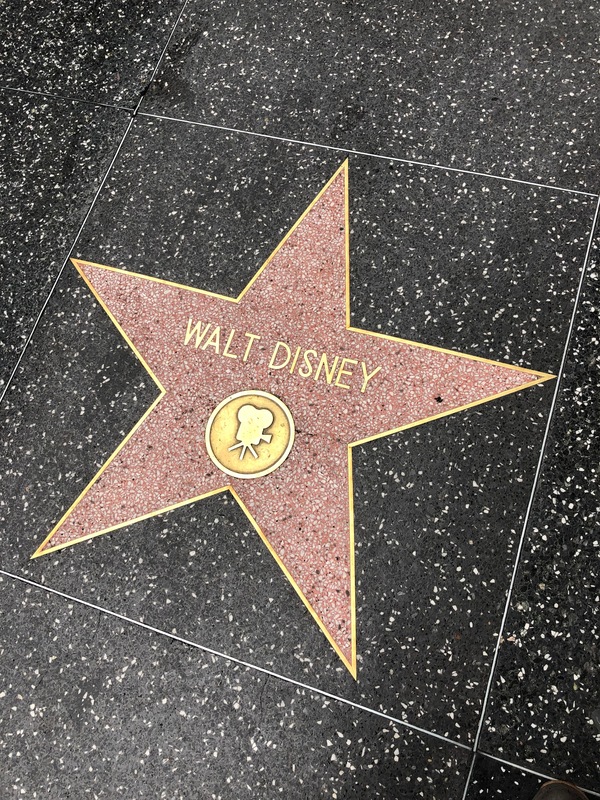 It's not clear whether Mickey Mouse or Walt Disney is the most popular photo opportunity; Walt can be elusive as his star is in front of a bus stop and is not very prominent. Continue walking east on the south side of the street and cross Orange Drive. You are now getting to one of the busiest parts of Hollywood Boulevard. Mickey Mouse is definitely your busiest star on this tour, especially due to his prominent location. Photo by Todd Pickering. Walking on this block you will start to see the signs for the TCL Chinese Theatre (Grauman's Chinese Theatre). In front of this theatre are the famous hand and foot prints of stars. Mickey's star is right before you get to the handprints, so if you are rubber-necking and arrive at the handprints take a few steps back. Folks are always good about letting you take a snapshot but by 10:00 a.m. this place is packed with throngs of tourists. 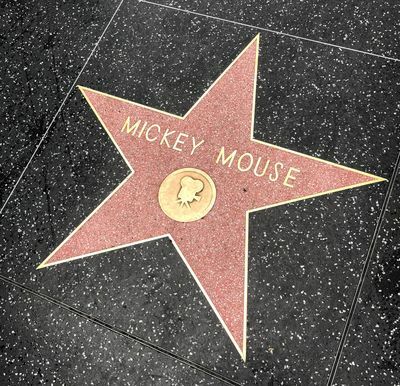 Mickey Mouse was the first fictional character to receive a star on the Walk of Fame in the 1970s. To learn more about the Mouse that started it all check out Walk of Fame Wednesdays with Todd Pickering. Once you have taken your picture, turn around and walk back west towards Orange Drive again. Cross the street towards the south side and then begin walking east. There are also some coffee shops along this route if you need a pick me up. 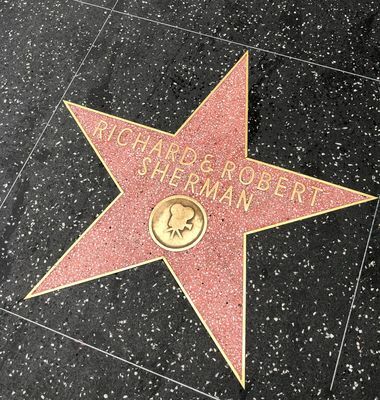 Musical brothers Richard and Robert Sherman share a star. Photo by Todd Pickering. Just past Hooter's you will see the star of Walt's favorite musical brothers, Richard and Robert Sherman. The Sherman Brothers are responsible for The Aristocats, the theme from "it's a small world," and their most popular work, the feature film Mary Poppins. 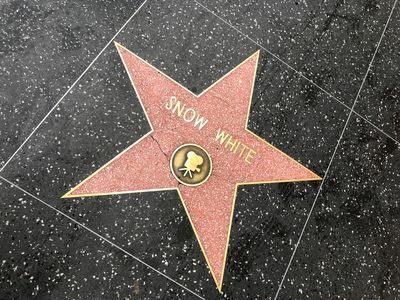 Disney's first princess and first feature animated star Snow White is honored. Photo by Todd Pickering. Walk a few more paces east, in front of a souvenir shop and directly across the street from The Hard Rock Cafe is Disney's first princess and star of the company's first feature film, Snow White from Snow White and The Seven Dwarfs, naturally. Michael Eisner's star is directly in front of the "Jimmy Kimmel Live" studio. Photo by Todd Pickering. Walk east a few more paces and directly in front of Jimmy Kimmel Live you will see The Disney Company's CEO from 1984-2005, Michael Eisner. It's rare to see someone taking their pictures at this star, but I would be remiss not to mention him as you are heading east towards El Capitan Theatre. 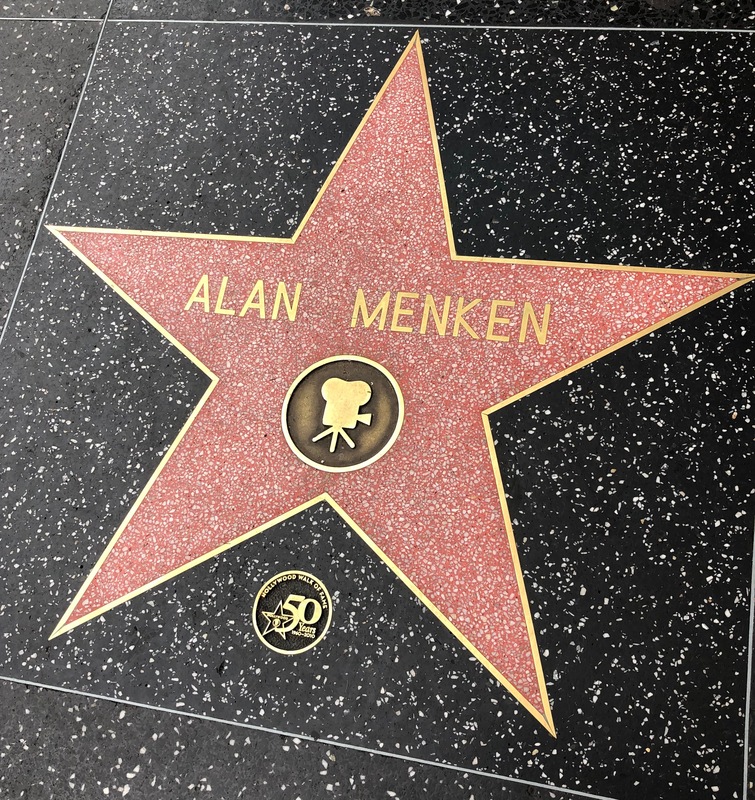 Alan Menken's star is at the very edge of "Jimmy Kimmel Live." Photo by Todd Pickering. A few more paces east just at the end of Jimmy Kimmel Live you will see another composer for Disney, Alan Menken. This Academy Award winning composer has worked on such films as The Little Mermaid, Beauty and the Beast, Aladdin, and Hercules. Notice that he has a 50th plaque on his star. 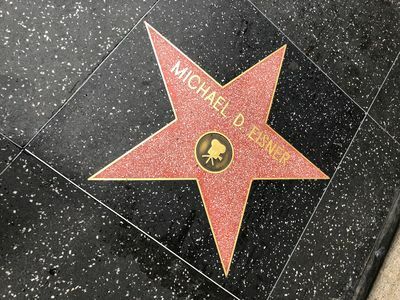 That meant that he received his star in the year of the Walk of Fame's 50th Anniversary. The biggest clump of Disney stars are in front of El Capitan and Ghirardelli. Photo by Todd Pickering. 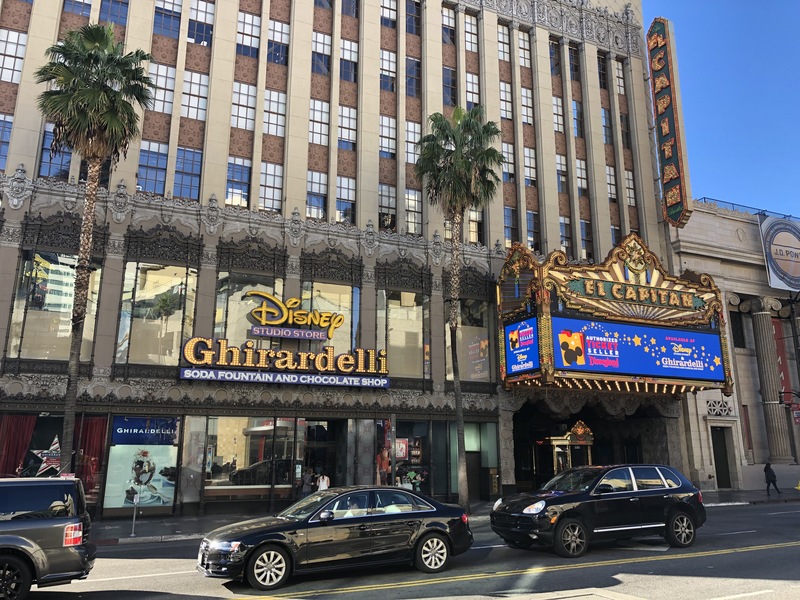 Disney owns El Capitan Theatre and right next door to that is San Francisco's Ghirardelli Soda Fountain and Chocolate Shop. Ghirardelli also houses a Disney Studio Store. The merchandise is usually associated with whatever film is showing at El Capitan. There are some exclusive Disney Trading Pins available there and you may also purchase your Disneyland tickets here. The next ten stars listed below are in front of this building. Make sure you go and see a film here at this amazing theatre or you can also telephone and get a tour. For more information on this amazing movie palace check out this article on El Capitan. Mark Hamill has the first star you will see in front of El Capitan Theatre. Photo by Todd Pickering. Mark Hamill just recently received his star in front of this theatre. With the Disney reboot of the Star Wars series this is also an apt star to include in the Disney properties. Harrison Ford is across the street at the Hollywood and Highland mall if you are a Star Wars fan. Oddly enough, George Lucas and Carrie Fisher do not have stars. 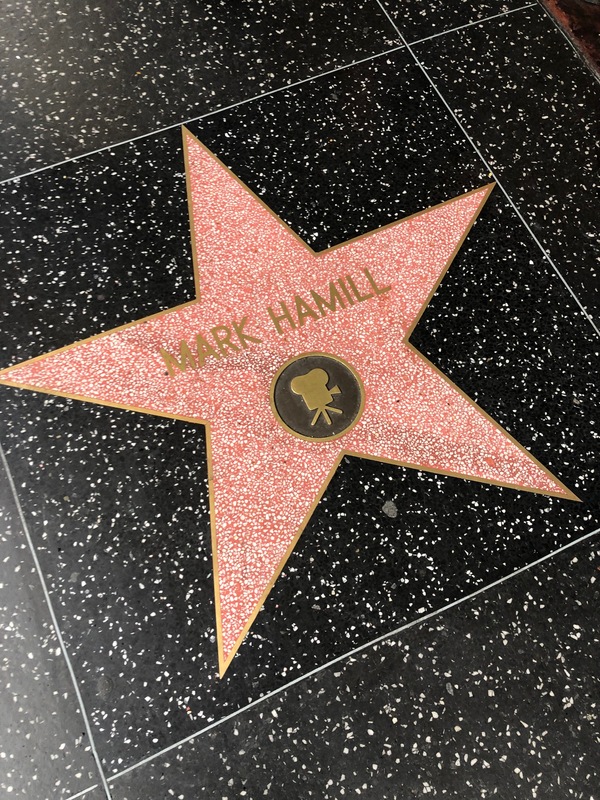 Mark Hamill went on record to say that he is championing a star for his co-star, Ms. Fisher, but she was not chosen for the posthumous star in the 2019 line-up. Minnie Mouse got her star almost 40 years after Mickey Mouse. Photo by Todd Pickering. 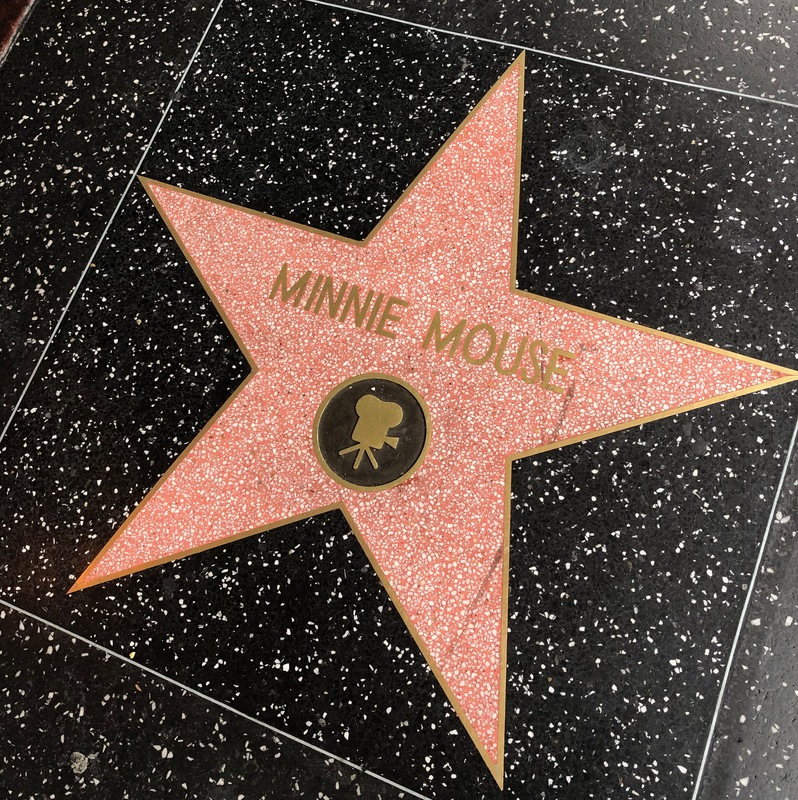 Minnie Mouse received the most recent Disney and fictional star in 2018, which is well deserved and only 40 years after Mickey. Hey, she was in Steamboat Willie also! The Muppets have a collective star. Yay! Photo by Todd Pickering. One of the most popular group stars next to The Munchkins are those lovable Muppets. Their studio is just south down La Brea Avenue about a half of a mile at the old Charlie Chaplin Studios. Kermit is seen dressed like Chaplin's popular Little Tramp character. 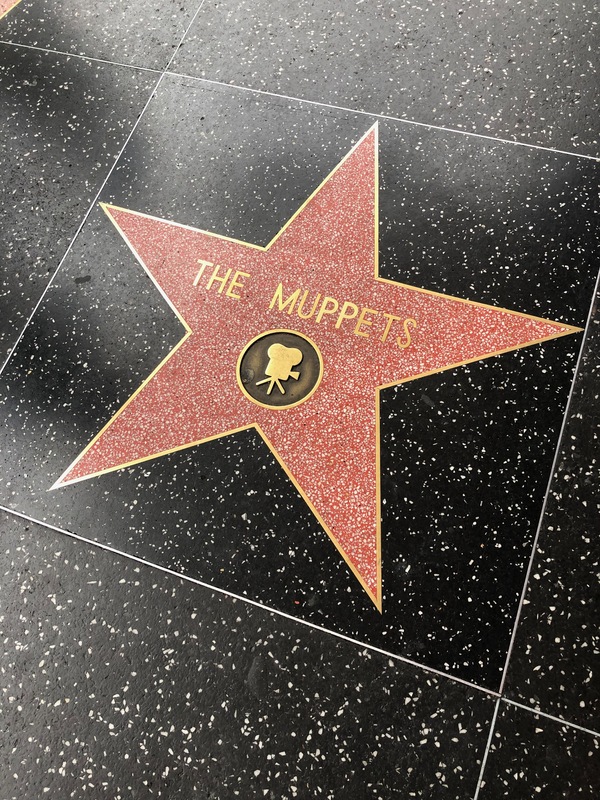 If you are interested in Kermit the Frog's personal star, it is also across the street at Hollywood and Highland. 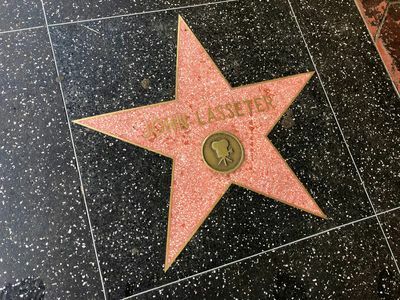 John Lasseter of Pixar fame has a star. Photo by Todd Pickering. John Lasseter has bowed out of the Walt Disney Company, but the Walk of Fame will never take a star off the famous landmark. There are many people more controversial, but that is best saved for another walking tour. 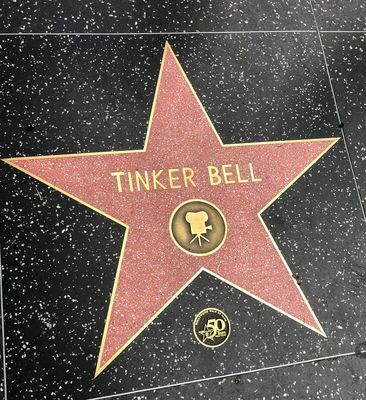 Tinker Bell also received her star during the Walk of Fame's 50th anniversary. Photo by Todd Pickering. Disneyland received a star in 2005 on it's 50th anniversary. Photo by Todd Pickering. The Walk of Fame does give out honorary stars to such organizations as the baseball team, The Dodgers, or corporate sponsors like Absolut Vodka but on the 50th anniversary of Disneyland and directly in front of the Ghirardelli Store is a much deserved star to honor what Walt and Roy built that has entertained millions of people for 60 plus years. Arriving before the store opens for business is always a good idea if you want to get lots of pictures because it is directly in the doorway. 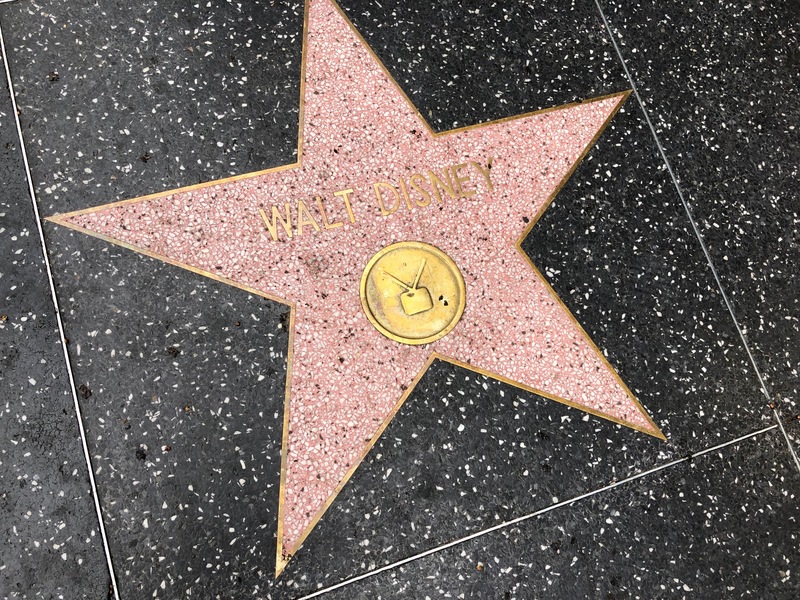 To hear more about the Disney stars in video form click here to watch this episode of Walk of Fame Wednesdays with Todd Pickering. 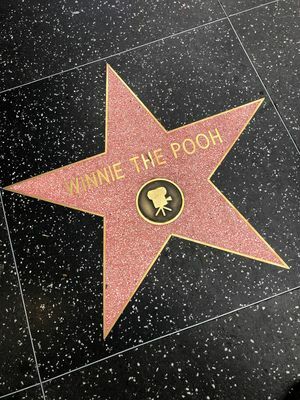 Winnie the Pooh, that silly ol' bear, has a star. Photo by Todd Pickering. For a while the popularity of Pooh eclipsed Walt's beloved Mickey Mouse. The silly ol' bear is still popular but that is no longer the case. Especially with Mickey's 90th birthday celebration all year at the Disneyland Resort! 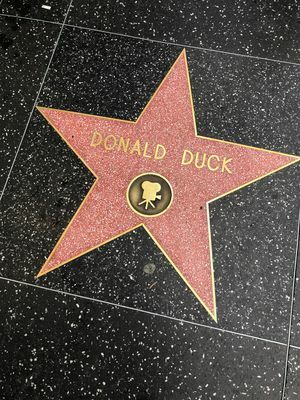 Donald Duck, that funny, fussy fowl has a star too. Photo by Todd Pickering. Everyone loves Mickey but a lot more people identify with this cranky duck on a personal level. 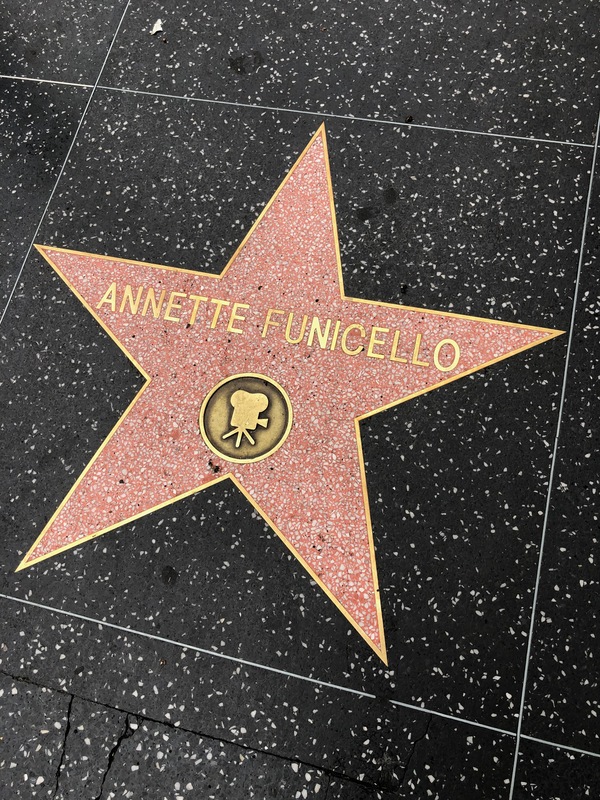 Everyone's favorite Mouseketeer has a star; Annette Funicello. Photo by Todd Pickering. Again the kids may not know who this is but she was the first Mousketeer to become a star in her own right. Make sure your kids know that Justin Timberlake, Ryan Gosling, Britney Spears, and Christina Aguilera all were Mouseketeers. Wait... do they even know these people? She has a star for film since she had a successful film career also, especially in beach movies with Frankie Avalon. 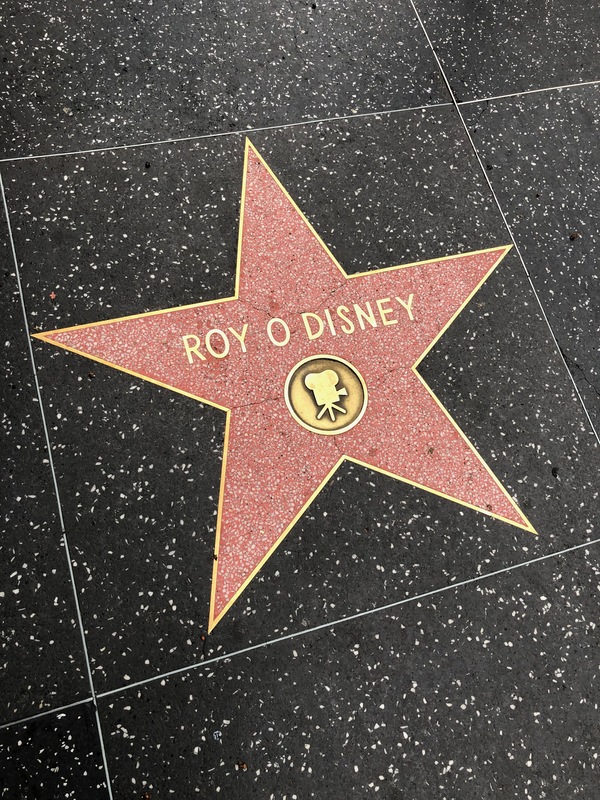 Roy O. Disney, not to be confused with Roy E. Disney. Photo by Todd Pickering. The original name of what is now The Walt Disney Company was the Disney Brothers Studio founded by both Walt and Roy. The reason that there is an O. in Walt's brother's name is so as not to confuse it with Walt's nephew and Roy's son, Roy. E. Disney, who took over the company after his father's death in 1971. After Roy O. Disney you may notice that there are some stars of Marvel movies around here so if you are counting yourself as a big Disney/Marvel fan there are more stars for you. You will pass the Snow White Cafe on your way to the last star. Photo by Todd Pickering. Continue walking east towards Highland Avenue and cross the street kitty-corner as this is an X shaped intersection with a dedicated pedestrian traffic light. You will see the iconic Hollywood First National Bank Building and then continue east on Hollywood Boulevard. You will pass the Snow White Cafe (not owned by Disney) walk one block east and cross McCadden Place and you will see a Starbucks. Near the entrance is your last star on this tour. Last stop on the Disney tour of the Hollywood Walk of Fame. Photo by Todd Pickering. 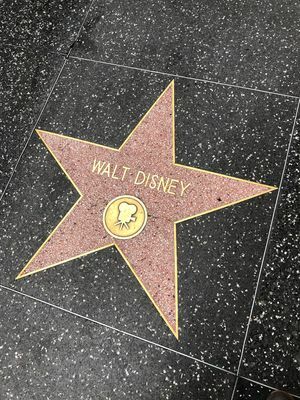 Walt Disney has a second star for his achievement in television. Photo by Todd Pickering. Walt's second star is for television. ABC built Disneyland in return for the television program Disneyland, and Walt and Roy bought the park back from them. Now the Disney Company owns ABC. We have come to the end of the tour and you may enjoy a coffee if you fancy. With all of the tourists that grace Hollywood Boulevard this makes it much easier to hit all of the highlights and not miss out on a star. Have a great new year and MousePlanet will see you back in the parks in 2019.